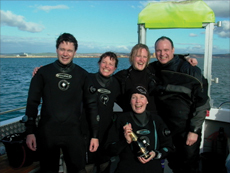 The last time I'd dived in Portland Harbour was 9th October, 2005. My log book entry reads: "Countess (AGAIN). Safety diver on wreck course. Suit leaked, viz crap , lost instructor. Diving is fun. Ho ho." Isn't it funny how familiarity breeds contempt? 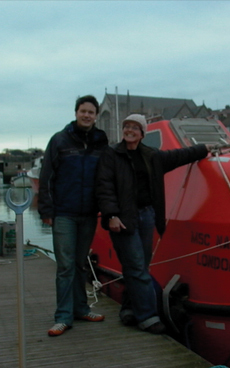 A week later I came down with a mystery illness and on the 30th December 2005 began a year of grinding chemotherapy. Fast forward through the misery of 2006 to January 2007 and I'm off chemotherapy and with four good friends to join me, set off on Scimitar into Portland Harbour on a recreational jaunt. Having watched our kitting up antics with a bemused smile, skipper Smudge tactfully suggests we start with the Countess of Erne. I have compiled an extensive list of "Things No One Tells You About Chemotherapy." Item #249 is that many people actually gain weight during treatment – including me. A combination of steroids to combat nausea and the difficulties of maintaining any sort of exercise regime with the up/ down nature of the drug cycles has left me a hefty 10 kilos heavier than my former life. It takes all five of us to get me into my dry suit, although I pretend it's just a team building exercise. Fully testing the sturdiness of my dry suits seams, I struggle into the rest of my kit and waddle to the dive lift between my two buddies who have offered to babysit me and launch myself into the water like a giant rubber ball. The Countess is exactly as I remember her in winter: there are no fish, the viz stands at 3- 4 metres and the water is 9 degrees. I have a fantastic dive. 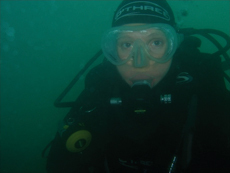 No contemptuous familiarity here, just a sense of fervent relief that I'm able to do this again – and all the skills I was worried I'd forgotten come back: knocking off buddies' masks; kicking up the silt; bashing the wreck; and scaring the marine life. It was as if I'd never been away. For our second dive, we mooch over to the Landing Craft/ Bombardon Unit. Smudge assures us he'll drop us on the Landing Craft, and reminds us we could then swim over to the Bombardon Unit.I drop onto the wreck and think, ‘Blimey, the Landing Craft's changed in a year – it looks just like the Bombardon Unit.' We swim to the other wreck, and round that wreck and it's only 32 minutes into the dive that I finally realise Smudge had dropped us on the Bombardon Unit first, not the Landing Craft, which is why it looked so much like, well, the Bombardon Unit. Dive skills: fine. Powers of observation: crap. Back on board, a half drunk mug of hot tea is whisked out of my hands by an efficient Smudge, who reappears from the wheelhouse beaming and clutching 6 clean mugs and a bottle of champagne. I manage to dissuade one member of Team CF who thinks it should be broken over my head in the manner of a ship-launch – I point out that this was more of a re-launch. Someone else suggests shaking the bottle and spraying champagne all over the deck, a la Formula One. However, never one to let good alcohol go to waste, we settle for drinking it - backs to the sun, surrounded by dripping kit and seagulls, all slightly hysterical from mild hypothermia. It's good to be back! Previous article « Can I Dive With - An Outer Ear Infection?